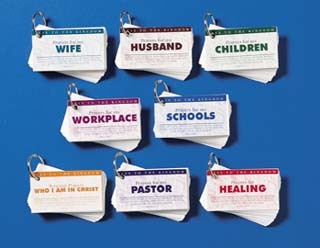 I use these “Keys To The Kingdom” Prayer Cards to pray for my wife and my sons. There are various sets, with each set containing forty short Scripture-based prayers the size of a business card on a key ring. I keep the two sets I use (WIFE and CHILDREN) open on my dresser, which prompts me to pray for them each morning as I get dressed. I simply flip a card to a new prayer each day. They are also the perfect size to be kept on the dash of your car, on your desk at work, or in your purse/briefcase/etc.. They are available through Prayer Point Press. The PrayerMate App is one I’ve just downloaded onto my iPhone and currently am trying out. (An Android version is also available.) It was recommended to me by blogger Tim Challies, who says it is his favorite prayer app. Check it out further at: http://www.youtube.com/watch?v=RYu8RsVXcCE. I’d actually planning to enter all the prayers from my “Keys To The Kingdom” cards into this app to make it handy to refer to them throughout the day. Scotty Smith is a pastor who I love to hear/read pray! He has a regular blog called Heavenward where he publishes his prayers. They can also be accessed through his Twitter feed. He inspires me to pray and teaches me how! If you haven’t yet read the prayers in The Valley of Vision, you must get yourself a copy. This collection of puritan prayers feeds my soul and teaches me how to pray more than anything else I’ve ever come across. It is also available on audio CDs read by Max McLean (great voice). Currently this sits on my nightstand by my bed, and I try to read and pray through a prayer from it each night before dropping off to sleep. I just discovered this Daily Prayer Devotional from The Valley of Vision published on the Banner of Truth website. I haven’t yet figured out how to have it sent to me daily as a Tweet, blog or email. So if you do, please pass it on to me! Joe Thorn prays through The Valley of Vision in 13 weeks using 3 daily “appointments” scheduled at 9am, 12pm, and 3pm Monday through Friday. Check Walking Through The Valley of Vision plan. I’ve been looking for some resources to help us prepare and lead the congregation in prayer during our Sunday services. Here are some very helpful resources I’ve found. D.A. Carson: Prepare Your Public Prayers! The Valley of Vision sits on my night stand too. I love it. Another prayer book I find helpful and lovely to read is A Way To Pray by Matthew Henry. I have the edition edited and revised by O. Palmer Robertson. As the book says, it is a “biblical method for enriching your prayer life and language by shaping your words with scripture”. It’s very good. To me, reading scripture inspired prayers is better than poetry. The Valley of Vision sits on my night stand also. It came as a treasured gift from you. It ushers me into the throne room of God in a way that I am at a loss of word to explain. Bless you in this new place that God has called you to. We will forever remember how you loved so well those that God gave you to shepherd at Lakewood.